Chrisma News report – How would you feel if a man walked into a business meeting wearing a skirt and 8-inch heels? Twenty years ago, that would have been absolutely unthinkable, but, if one American designer has his way, that may soon become the norm. 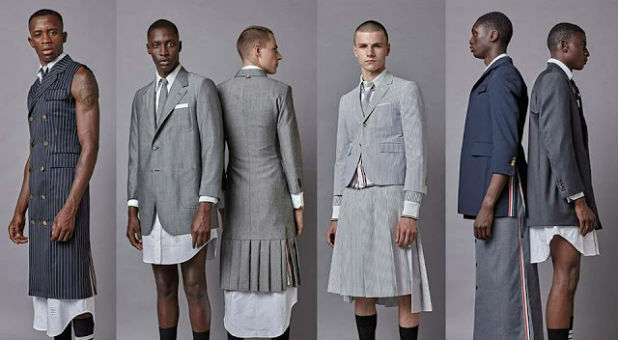 When I saw photos on Facebook of Thom Browne’s latest line for men, I have to admit that I was floored. If you have not seen what I am talking about yet, you can do so here and here. Personally, I believe men should dress like men and women should dress like women, but much of society is moving in the exact opposite direction. In recent years, we have been hearing a lot about “gender fluidity,” and this is yet another example of that phenomenon. The distinctions between men and women are being blurred, and there are many who would like to eliminate them altogether. Who says what a man should and shouldn’t wear? The collection seems to drive a conversation many of us never want to have. And, if a woman can wear a pantsuit, why can’t a man wear a skirt suit? This is probably what the designer wanted to us to talk about. I like the idea that when you are a baby you wear pretty much the same clothing as your brothers and sisters. And I think that culture dictates which way and what kind of clothing you wear—but it is nice that you can pretty much do whatever you want. For too many years, men have suffered from a lack of options in the fashion realm. So, four Chicago-based business school buds sought to rectify this injustice by introducing to the world (for better or for worse) the male romper—er, the RompHim.